American DJ Inno Spot LED DJParts - All Variety of Parts that DJ Needs. 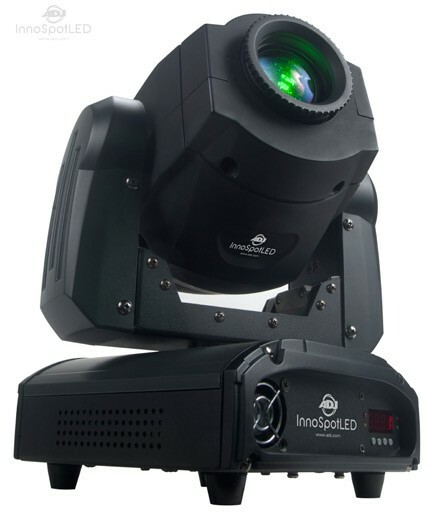 ADJ continues to push the boundaries of LED technology with the Inno Spot LED, a compact intelligent Moving Head with a bright 50-Watt LED source. It features 6 rotating, replaceable gobos, 8 colors plus white, and separate gobo/color wheels. It’s hard edge beam is similar to a traditional halogen or discharge lighting effect with a fraction of the power draw (93W) or the hassle of changing out light bulbs (LED source rated at 50,000 hours). The Inno Spot LED is lightweight and small in size making it extremely mobile, and can be set up by any size entertainer. It’s feature packed with exciting built-in light shows when used in Sound Active or linked in Master/Slave mode, offers 10 DMX channels, 4-Button LED DMX menu, Dimming, Shutter and Gobo Shake effect. The Inno Spot LED may be controlled via Sound Activation with it’s own built-in programs, a DMX Controller, or the ADJ UC3 easy-to-use controller. Specifications: • High output Intelligent Moving Head with a bright 50W white LED source • 8 colors + white • 6 rotating, replaceable gobos + spot • Separate Color & Gobo Wheels • Gobo scroll mode • 17-degree beam angle • Auto X-Y repositioning • 10 DMX Channels • 3 Operational modes: DMX-512, Master/Slave & Sound Active • 4-Button menu system LED Display making it easy to navigate • Built-in lighting programs • Gobo Shake effect • 3-facet prism • Gobo size: 23.8mm (19mm viewable / 0.2mm thickness) • 540° pan / 270° tilt (8-bit) • Manual Focus • Shutter: Pulse effect; random strobe slow to fast • Dimming: 0% - 100% • Fan Cooled • Stepper motors with micro stepping • Compatible with the ADJ UC3 Series easy-to-use controllers (sold Separately) • Runs extremely cool! - NO Duty Cycles! – Run all night! • Power consumption: 93W • Switchable voltage: (120V/60Hz or 230V/50Hz) • LED Source: 50W White LED source (50,000 hour rated) • Dimensions (LxWxH): 9.75” x 8.25” x 11.25” / 242 x 205.8 x 284.6mm • Weight: 15 lbs. / 6.5 kgs.